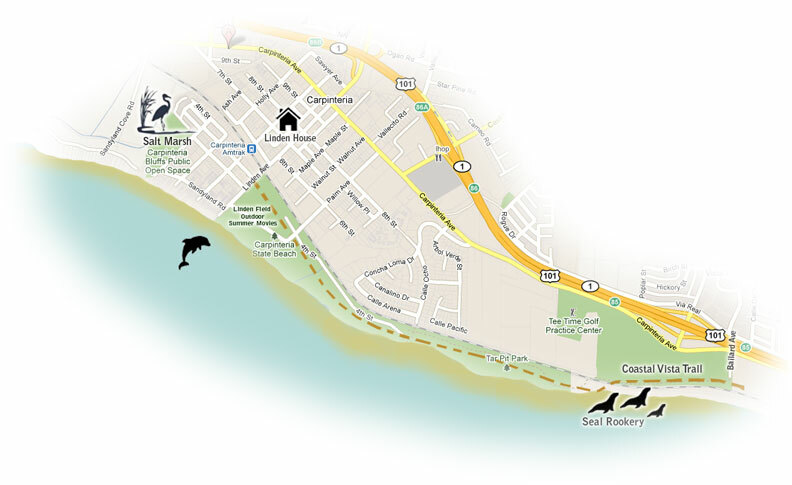 The Carpinteria Seal Sanctuary is an easy hike or bike ride from town by way of the Coastal Vista Trail. The trail runs for miles along the bluffs offering great views overlooking the ocean. Several lookout points offer a picturesque view of Anacapa, Santa Cruz and Santa Rosa Islands along with the local community of harbor seals sunbathing on the shore. The Carpinteria Harbor Seal Preserve is home to almost 100 adult seals who give birth to their cubs on the Carpinteria shoreline; one of the four harbor seal rookeries remaining along the southern California coast. Directions from Linden Avenue: Hike or bike south along the bluffs (the Coastal Vista Trail) that leads through Tar Pits State Park, then along the railroad tracks out to the seal rookery. This amazing trail stretches just over a mile without ever leaving the waters edge. Stop on the bluffs above the seal preserve, to quietly watch the seals playing in the water and sunbathing on the shoreline. The best spot for viewing is well marked with a sign, and has a bench for resting. The sanctuary is a protected birthing habitat for harbor seals from December 1 through May 31st. Tip: Bring binoculars for the best view, please be respectful and do not attempt to approach the seals from the beach.